Norway’s beautiful Fefor Lake. A lace to enjoy all things outdoors. Those lucky enough to live in one of the most beautiful countries in the world will agree that winter is an ideal time to visit Oslo and Norway without the crowds. You’ll enjoy the wonders of Nordic life, whether it is venturing on the waters or experiencing the beauty of the surrounding mountains. It is also amazing to observe how many young Norwegians enjoy speeding through the cross-country tracks in the forests without another soul in sight or schussing down on the mountain slopes with fellow mates. For the beauty, the pleasure, and inspiration, my preference is to travel to Norway in winter and combine the experiences of the countryside and the capital in one spectacular visit. At Tryvann area total of 18 runs and a vertical fall of 381 metres. The area has 11 lifts, of which 2 are 4-seat chairlifts and 1 is a new 6-seat express chairlift. A visit to the land that Ibsen immortalized in Peer Gynt takes me deep into the extreme landscape of Norway, from lakes to mountains and through icy forests shrouded in heavy snow. This journey awakens my spirit and provides adventure into the world of mythic inspiration. High in the mountains of the Jotunheimen, the legendary trolls do mischief as Peer Gynt tries to outwit these clever elves in the forested wonderland. This land is full of surprises with trolls and flying reindeer that enhance this epic story where these sprightly creatures thrive and wild animals abound. On the road in Ibsen country, I feel the traditions and folklore forces of this wonderful landscape and how it has inspired Norway’s greatest literary writers for centuries. My travels take me back in time on a cultural journey to the time when the Danish Prince Karl was crowned Norway’s King Haakon VII. As a way of showing his Norwegian identity, the King took up Nordic skiing under the guidance of famous polar explorer, Fridtj of Nansen. King Haakon and Queen Maud came regularly to Fefor and stayed at the Fefor Hoifjellshotell before traveling to their own lodge. 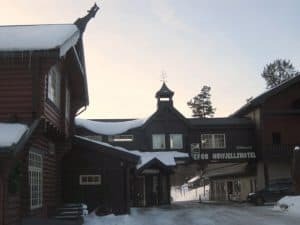 Visitors to Fefor Hoifjellshotell can experience the royal history and stay in one of the hotel’s guest suites occupied by the former King, Queen, or alternatively, another famous Norwegian. One of the most notable guests was Captain Robert Scott who stayed here in 1891 prior to his own polar expeditions. Norwegian heritage and traditions remain strong to this day in Fefor. Most recently, Nordic exploration teams have used this terrain to prepare for Arctic expeditions to the North Pole. One of the top trainers is Martin Norman, who continues to come to Fefor to share his expertise with skiers. As an expert guide, Martin provides the fine points of cross-country skiing before leading me on the trails around Fefor Lake. Even though this sport can provide an intense workout, Skiing on the freshly-made parallel tracks, I enjoy the crisp white snow glistening on sunny trails along the outer rim of the lake. This remoteness provides contemplative moments to be part of nature and wholly embrace the wilds. I notice the families, and am amazed to see that some of these parents bring their little ones along in a sled Norwegian style. In particular, one proud father on skis has a tiny baby girl bundled in a “pulk”. 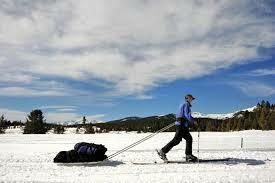 Parent Pulling Baby Bundled in a ‘Pulk’ across a snowy field. There is another father with two children in brightly colored ski attire who seem to be having a wonderful time playing in a tree limb. Striking up a conversation, the father happily remarked that he hoped his children would retain memories of this peaceful spot. Cross-country skiing is a part of the tradition and a way of life in Norway. 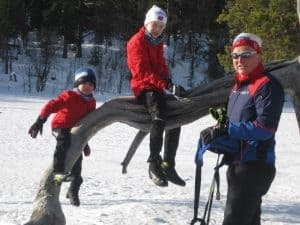 Norwegian Families enjoy the outdoors year round. After an exhilarating morning of cross-country skiing, it seems fitting to find a more leisurely pursuit for further exploration. Ice fishing for Arctic char seems to be an ideal option. Experienced sportsman, Gier Arne, takes me snowshoeing on a winding trail down to the lake. Shimmering sun light is directly overhead as Gier shows me how to drill with an ice auger, one hole after the other. No bites on my line doesn’t perturb me, I feel enraptured by the stillness This memorable experience will last a lifetime. Invigorating cross-country skiing across beautiful surrounding landscape is best followed by relaxing in the indoor heated pool and sauna. The delightful afternoon tea in the company of other guests is something not to be missed. Delicious, hearty soup, a variety of homemade cakes and breads, and hot beverages. Such simple pleasures go along way and in the glow of the fireplace as we relax and contemplate the day’s activities. 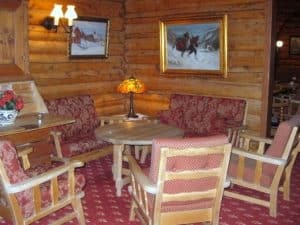 There is a pre-dinner classical concert followed by an enticing smorgasbord as all enjoy the rustic setting and feel part of this ‘pure Norway’ in this traditional mountain house. 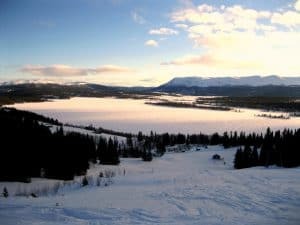 I traveling from Fefor for three hours by train, to Oslo to downhill ski at the Winter Park Ski Resort at Tryvann in the outskirts of the city. At the City Center, I hop on the Metro with Nordic and alpine skiers, as well as an array of families carrying toboggans to sled at the resort, just 40 minutes away. 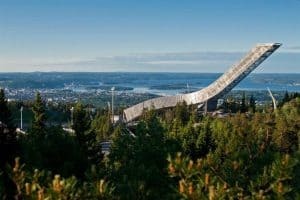 Along the way, we pass the Holmenkollbakken ski jump and museum, which is noted as Norway’s famous Olympic site. At the top of Holmenkollen’s peak, is a camaraderie of fellow skiers who want to experience the fresh snow that fell the night before. The next day I opt to cross- country ski in the woodlands near a glacier lake. In this resort, the pleasures of skiing can extend until 10 p.m., which provides plenty of time to enjoy the slopes and trails. There is the beautiful scenery and amazing views overlooking Oslo Fjord, due to the resort’s high elevation above the city skyline. In seeking accommodations within proximity to the ski resort, I choose the Swedish owned, Voksenåsen Culture and Conference Hotel, located within walking distance to the Metro and bus transportation to the slopes. Beautiful scenery that provides amazing views overlooking Oslo Fjord, the Voksenåsen Culture and Conference Hotel,. This 4-star hotel offers another secluded woodlands setting. I feel right at home in this quiet and relaxing atmosphere. After a full day of skiing, I can access the sauna and fitness room. 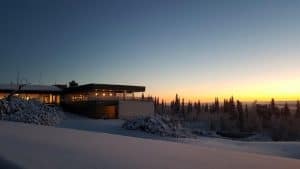 Fine dining is available in their Scandinavian restaurant and bar overlooking Oslo, which heightens the pleasure of dining on property. Author, Deirdre Frost lives in the Northeastern United States and enjoys many winter activities including cross-country and downhill skiing.